Elite’s Choice is an education resources consortium. We aim at delivering values to our customers through exceptional solution-mind services and excellent supply-chain capabilities. We offer a variety of services primarily to International, Private and DSS Schools in Hong Kong and Macao. Elite’s Choice has over 10 years experience in books and educational supplies. Elite's Choice provides theme / curriculum based solutions such as turn-key school-wide Reading Program Development, Library Supplies as well as Textbook / Reference Supplies. 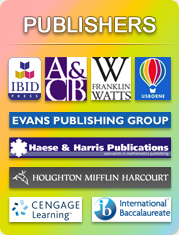 We are a team of professionals with over 10 years experience in education and book industry. We understand curriculum and challenges. We take requirements from education professionals and transform them into corresponing solutions. We have direct connection with sources of supply (e.g. publishers and educational materials suppliers) from all over the world, which helps provide more cost-effective solutions.